How Can I Try CADS? 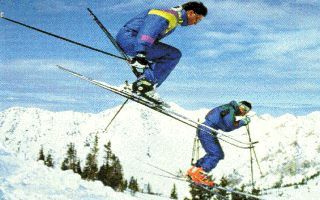 Free CADS demo has been available on Vail mountain on a seven-day-a-week basis since early 1991. To make an appointment, call Jenny Dandy at 970-949-4533 or Walter Dandy at 970-470-2410 (cell). We meet at MidVail, usually at 11:00am. Come with all your ski equipment. Temporary CADS equipment is quickly strapped on and fitted up, and then we do a lot of skiing. We always start on easy, groomed terrain, and progress in accordance with what is indicated by skill level and appetite. This free CADS clinic will familiarize you with the use of the system, while it also enables you to analyze the effects for your skiing and your symptoms. CADS installation takes place after skiing and before dinner in Avon. Expect installation to take about an hour. Scheduling priority for each afternoon installation session goes to the participants in that day's on-mountain introduction. If travel plans, competing early evening obligations, or financial considerations would preclude your completing the process on the day of introduction, we request that you delay making an appointment to ski until there is no such impediment. We are able to offer this program without charge as long as our on-mountain time is not taken up with those who know in advance of some reason why they are unable to get CADS.